Welcome to the Cleobury Mortimer Town Council Website. The site is updated on a regular basis with the latest news and also the minutes and agendas from our meetings. Cleobury Mortimer is a small rural market town in Shropshire. The town’s parish had a population of 2,892 according to the 2011 Census, with an estimated population of 3,500 in 2017. Although often regarded as a village, it is in fact the second smallest town in Shropshire (after Clun), having been granted a Town charter in 1253. 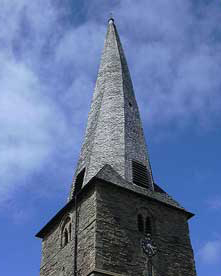 There are a number of landmarks in the town, the most famous of which is the 12th Century St Mary’s church in the town centre, renowned for its crooked spire, the combined result of the warping of its oak timbers, and damp-induced rot where the timber spire sits on the masonry tower. Close by the churchyard is The Wells, fed from a local spring and for centuries serving as a public water supply. To the west of the church is the recently refurbished Market Hall, which now houses a number of facilities including the Tourist Information Centre. There are 8 public houses in Cleobury Mortimer, as well as a secondary school and primary school, library, and fire station. This website is maintained by Cleobury Mortimer Town Council. Every effort is made to ensure the information is accurate and up-to-date although there can be no guarantee of this. The Town Council will not be held responsible for any loss, damage or inconvenience caused as a result of inaccuracy or error contained in these pages.If you discover any errors, inaccuracies or out of date information, we would be grateful if you would inform the Clerk.